Sunflower seed butter makes them nut-free (great for anyone with allergies!). You can substitute any nut butter though. Dates add natural sweetness and are rich in fiber, iron and potassium. Pumpkin seeds provide protein, vitamin E and B-complex. Hemp seeds are a super plant-based source of protein and healthy fats. Chia seeds help digestion as they absorb 10x their size in water (that means they help move things on through your digestive path). They are also a great source of Omega-3 fatty acids. Sesame seeds contain protein, copper, manganese & iron to name a few. They can help lower cholesterol and balance hormones. Place the dates and pumpkin seeds in a food processor, pulse several times until finely chopped. In a separate bowl, add the date and pumpkin seeds combine with remaining ingredients. Mix until really well incorporated. 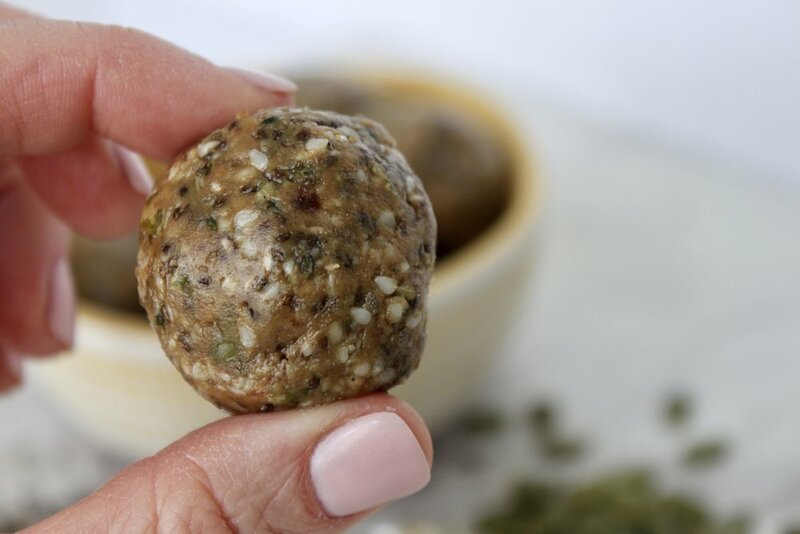 Using 1 tablespoon measurement, roll into balls.